When a police officer is murdered, numerous things happen. Shock, sorrow, and anger all hit at once- particularly in the officer’s own department and departments that work closely together. 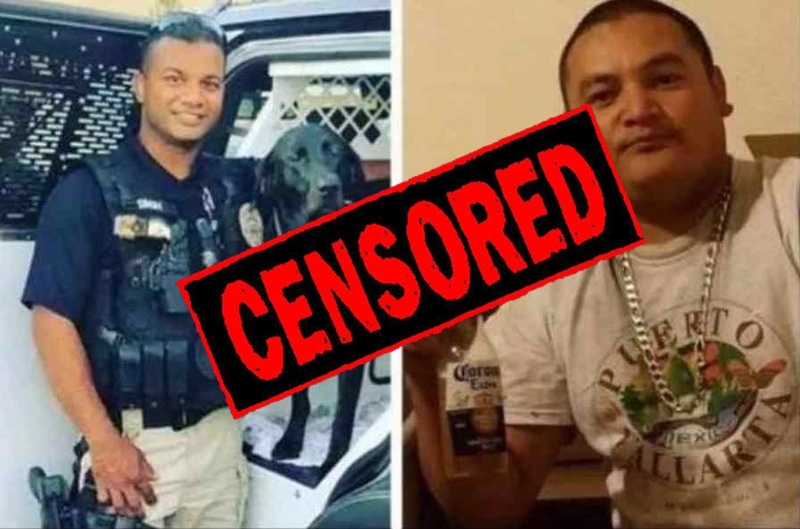 In the case of Corporal Ronil Singh, the entire Newman Police department was hurting, including the Stanislaus County Sheriff’s Department. 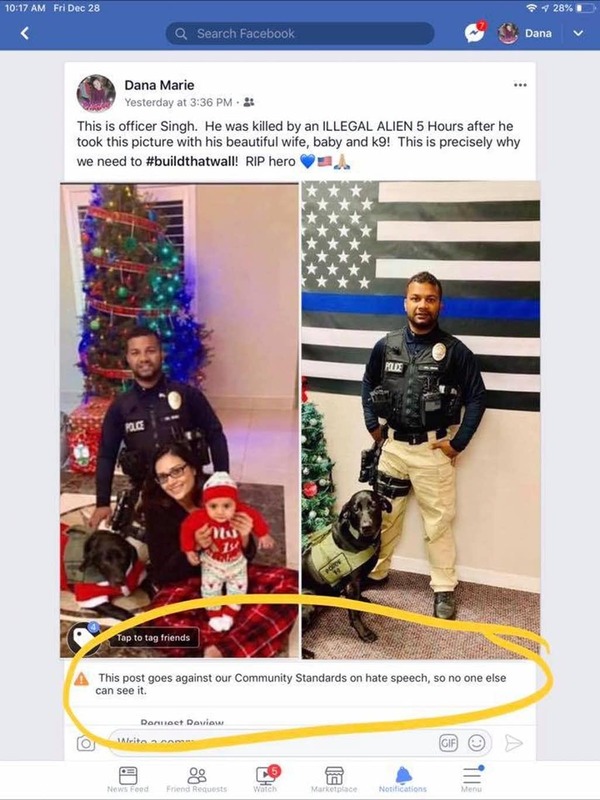 But when a Stanislaus County Deputy posted a meme stating the fact that the suspect was illegal, his Facebook account was suspended. The post was returned, but the deputy is still suspended for 30 days. 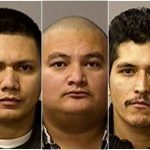 “Illegal alien” is the official term used by the U.S. government since the Reagan administration to describe people who are in the country illegally. The words “illegal alien” are apparently protected speech by Facebook – and they should not be protected. 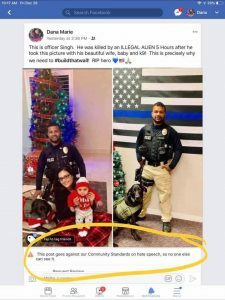 Cpl Singh’s murder has created a firestorm, and apparently triggered Facebook contractors who sit in a room and have just seconds to decide whether a post violated their complicated rules or not. That’s no excuse for poor policies. Ronil was a LEGAL immigrant from Fiji, who came here to serve our nation and his community and is worthy of respect and honor. 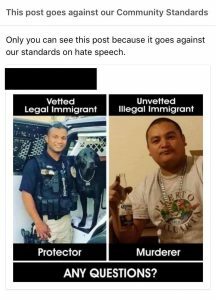 Gustavo Perez Arriaga is an ILLEGAL who came here to destroy and prey on communities – he is not a person worthy of respect or honor. We were advised that the deputy in question has his post restored, exactly the same as ours was restored, with the apology from Facebook that “they got it wrong.” But his account was still suspended for a month. This is happening way too often. 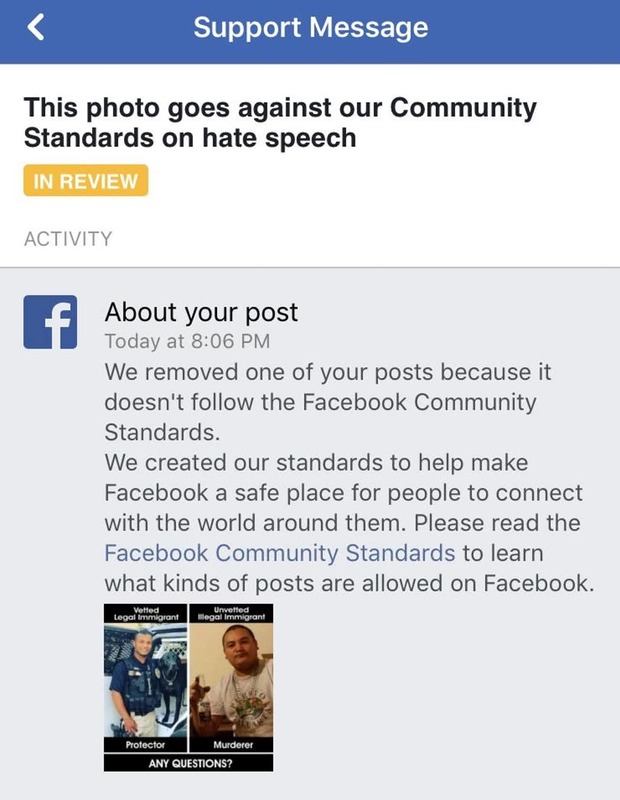 Facebook needs to be revamped, and their egregious censorship policies removed. They want a safe environment for people, but they tend to target all the wrong posts. This sounds all too familiar from the fine folks at Facebook. 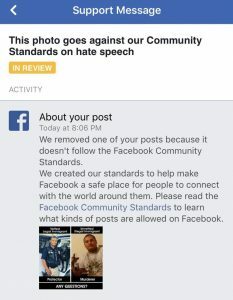 facebook is against a conservative agenda. Progressive or liberal agendas appears to be what is okay to promotes. Not fair according to the First Amendment. Thank you Regina, for your encouragement. I’m actually a columnist, not a journalist, but your words of encouragement are appreciated very much! FaceBook is another group of socialist illegal loving America hating liberals. 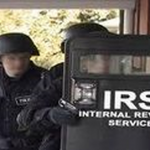 They would rather defend any and all illegals and put them in the same class with immigrants who are here legally. Perhaps if they or a family member had to endure the horror these animals have brought to others then and only then they might understand the need to take back our country. But no, they and their boss are complicit in the leftist agenda to destroy America and create a liberal utopia. Damn them all to hell.